Have you ever attended a conference that was so inspirational and fun that you wanted to go back every year? Well, I have. 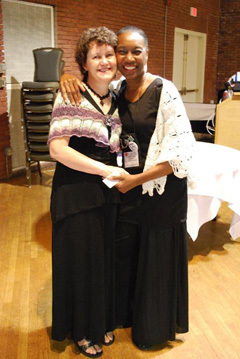 Let me tell you about the CGOA Conference that was held in Manchester, NH last month, from July 23 through July 27. 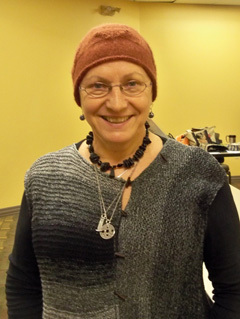 Jennifer Ryan is modeling her Faux Tatted Necklace that she finished during that 3 hour class. Isn’t her necklace beautiful? This necklace is actually crocheted to look like it’s tatted. Check out Jennifer’s website if you’d like to see some of her fabulous designs and photos of the yarn bombing at the conference! Jennifer headed up the yarn bombing and it was amazing! If you don’t know what a yarn bombing is, it’s a special display of crocheted pieces that are wrapped around stationary items, such as benches, poles, etc. The yarn bombing was wonderful, thanks to Jennifer’s hard work! 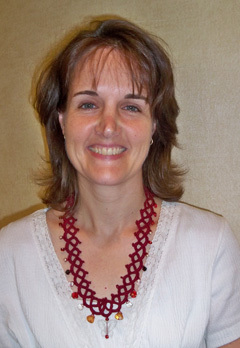 The light blue necklace was made by Juanita. 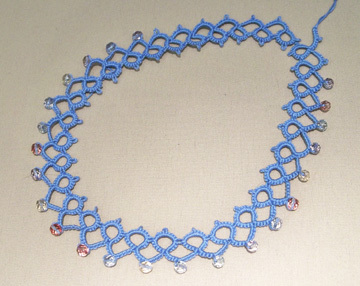 This is a real tatted necklace, not a faux tatted crochet necklace. Juanita had it almost done on Sunday after taking my shuttle tatting class on Thursday. She really took to tatting like a duck takes to water! Juanita took my Faux Tatted Necklace class, too, and finished that necklace shortly after the class. 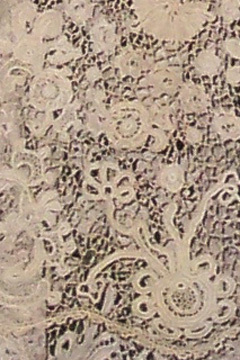 One of my tatting students wrote a short blog post about learning to tat. You can read Lindsey’s blog post and see pictures of her finished and/or in-progress tatting projects here. I’m very proud of all my students. They all learned the subject of the class, whether it was shuttle tatting, faux tatting or symbol crochet. They each worked at their own pace and understood what I was teaching them. I had a blast teaching and enjoyed meeting all of my students! They were fabulous!!! I haven’t blocked it and I don’t intend to block it, since it’s just a swatch for learning purposes. 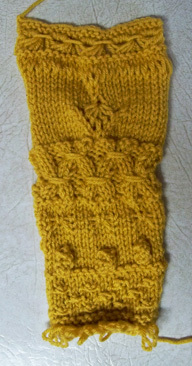 As you can see, I learned many new knitting stitches and techniques in Michelle’s class, including bobbles. Now, lest you think that’s all I did at the conference, I’ll tell you about the other things I did. I took the Wednesday morning event called “Get Your Geek On”. There were a bunch of us there discussing various “geeky” things about crochet, such as how we hold our hook, yarn, etc. It was fun! On Wednesday afternoon, I was one of 3 presenters at the first CGOA Masters Day (it was half a day, but you get the idea). We talked about the CGOA Masters program in general, reviewed some swatches, talked about gauge, reviewing your own work, organizing Masters portfolios, as well as joining smoothly, finishing off and weaving in ends neatly. We had a great turnout with around 30 attendees. They were all eager to learn more and get their questions answered. I think it was a big hit! 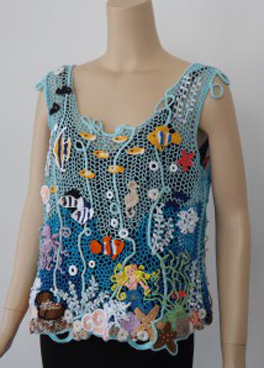 There were tons of fish, a mermaid, seashells, an octopus, a seahorse and lots more in this fabulous crocheted top. The photo doesn’t look quite as good as the actual piece up close and personal! On Saturday morning, I attended the CGOA Board meeting, since I’m the secretary on the CGOA Board of Directors. It’s always nice when we can have our board meeting face-to-face instead of through conference calls! The CGOA Board members make decisions on how to improve CGOA and where we should be heading each year. It’s an honor to be on the Board and to help steer CGOA in positive directions! This past year, we’ve updated the CGOA website to add crochet videos and to update the look of the website with a new banner, which I had the privilege of creating for CGOA. On Saturday night, we had our banquet and fashion show. I enjoy modeling in the fashion show and being part of the “behind-the-scenes” of the models backstage! All in all, it was a fantastic conference. No, not everything went perfectly. When does it? But we all enjoyed ourselves and learned more about crochet by attending. I would be remiss if I didn’t show you the beautiful tiered cake that one of my mentees, Carlotta Craig, crocheted for CGOA’s 20th Anniversary this year! Isn’t this fabulous? Here’s a photo of Carlotta and me, too. She is one very talented and humble lady! 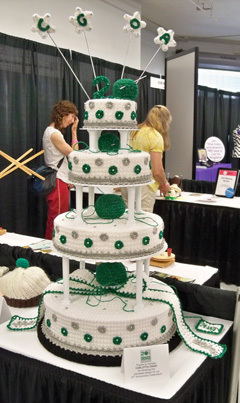 Next year’s CGOA Conference (aka: Knit & Crochet Show) will be held in San Diego! I can hardly wait!!! My husband and I used to live there back in the 80’s, in our “BC” days (before children). We had a little sailboat and sailed around Mission Bay on some weekends. My brother and sister-in-law still live in the area and my mother-in-law lives just 2 hours north of San Diego. It’ll be great to see all of them again (who can resist staying longer to get together with relatives?)! I hope you’ve enjoyed this glimpse into my week at the 2014 CGOA Conference. I hope you’ll be able to attend the conference soon. You won’t regret it!!! 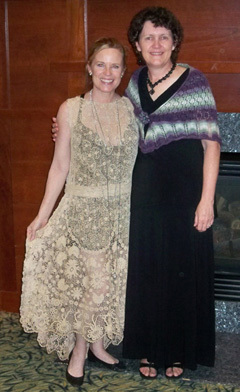 For more information about the Crochet Guild of America (CGOA), check out the CGOA website here. This entry was posted in CGOA, Conferences, Design Contest, Knitting, Learning something new, Symbol crochet, Tatting, Teaching classes and tagged CGOA, classes, conference, crochet class, crochet jewelry, knitting, teaching. Bookmark the permalink. It was great pleasure to have met you and be in your classes! Now I’ve learned Tatting and Faux Tatting! Both necklaces made were entered at a local fair and both received great reviews. The tatted necklace received a first place and the “Faux” tatted necklace a third place in their respective classes. It was wonderful to meet you, too. That’s great news about your 2 necklaces! Congratulations! You did a fantastic job on both of them and you were a joy to have in my classes. I hope to see you at the conference again next year.